TORONTO, ON – September 25, 2018 – It’s built to haul but ready to play. 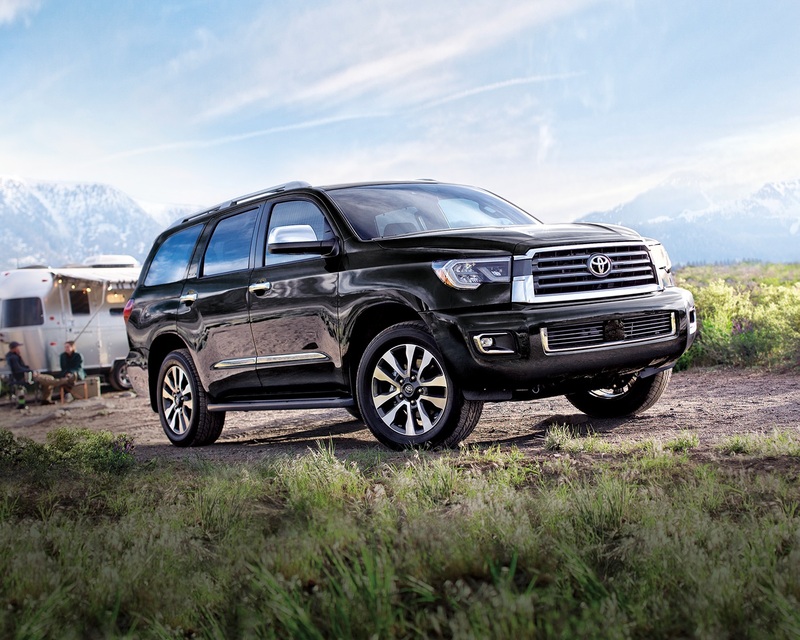 It’s the 2019 Toyota Sequoia – and whether you’re transporting a crew to the jobsite, friends and sports gear to the arena, or hauling a trailer full of fun to the cottage, Toyota’s full-size SUV can do it in comfort, style, and safety. Available in four configurations, all Sequoia models are outfitted with a towing package, impressive technology features and an extensive set of safety systems, headlined by the active safety technologies of Toyota Safety Sense P.
The 2019 Sequoia commands attention, curbside. This full-size SUV features bold styling, with a prominent grille and muscular profile. And with 9.5 inches (241 mm) of ground clearance, Sequoia is ready to ride above almost any terrain. Exterior features of note include LED headlamps with washers, LED daytime running lights and fog lamps, a power moon roof, roof rails and running boards. Inside, the cabin is spacious and comfortable, with plenty of glass to let in the light. There’s room for seven or eight adults (depending on model), while the fold-down rear seats – including power folding 60/40 split third row seats on all models – open up 120 cubic feet of cargo space behind the front row. The driver will appreciate Sequoia’s 6.1” Display Audio systems with Bluetooth® connectivity, integrated Sirius XM satellite radio and steering wheel-mounted controls, three-zone independent automatic climate control, power windows including the tailgate window, plenty of in-cabin storage, and more. Under the hood, Sequoia delivers the power and performance for every challenge. This full-size SUV’s 5.7L i-FORCE V8 delivers 381 peak horsepower and up to 401 lb-ft of torque. This engine is mated with a six-speed automatic super electronically controlled transmission with sequential shift mode for smooth and precise shifts. The transmission transfers power to the road or trail via an on-demand 4WD system with centre differential lock, auto limited slip rear differential, automatic disconnecting differential and two-speed transfer case. In addition, every Sequoia is outfitted with a trailer sway control system plus Toyota’s Tow Package, providing a towing capacity of at least 7,000 lbs (3,175 kg). Sequoia is the full-size SUV with full-size safety, too. Every Sequoia is standard equipped with Toyota Safety Sense P. This bundle of active safety technologies – including the Pre-Collision System with Pedestrian Detection, Lane Departure Alert, Automatic High Beams, and Dynamic Radar Cruise Control – enhances driver capabilities to mitigate collisions, stay in lane, and see at night. Other safety technologies standard on all Sequoia models include the Toyota Star Safety System, eight airbags, the Toyota Blind Spot Monitor and Rear Cross Traffic Alert systems, a back-up camera, a direct tire pressure monitoring system, an antitheft system, and more. The 2019 Toyota Sequoia SR5 5.7L (Starting MSRP: $60,965) features a 40/20/40 split folding second row seat for an eight-person capacity, a 7,100 lb (3,220 kg) towing capacity, 18” alloy wheels, eight-speaker audio system, leather seating, heated front seats, leather-wrapped steering wheel, and more. The 2019 Toyota Sequoia 5.7L TRD Sport (Starting MSRP: $66,275) adds TRD sport-tuned Bilstein shocks, TRD front and rear sway bars, 20” black alloy wheels, and front and rear clearance sonar. Inside, the middle row receives captain’s seats (for a seven-person capacity). Other interior details include a TRD shift knob, door sill protectors and floor mats. Exterior details include a gloss black front grille, lower grille chrome surround, black side mirrors and rear door garnish. The 2019 Toyota Sequoia Limited 5.7L (Starting MSRP: $67,890) features a 40/20/40 split folding second row seat for an eight-person capacity, a 7,100 lb (3,220 kg) towing capacity, 20” alloy wheels, 12-speaker audio system with navigation, leather seating, heated front seats, a driver’s seat memory system, leather-wrapped steering wheel, illuminated vanity mirrors, a power rear door with jam protection and rear door glass sunshade, a power tailgate lock, chrome vent knobs, steering wheel-mounted HVAC controls, exterior mirrors linked to seat memory with reverse auto tilt function, integrated signal lamps and puddle lamps, chrome exterior mirrors, door handles and rear trunk trim, and more. The 2019 Toyota Sequoia Platinum 5.7L (Starting MSRP: $76,075) features second row captain’s seats for an seven-person capacity, a 7,000 lb (3,175 kg) towing capacity, front and rear Adaptive Variable Suspension systems, unique 20” alloy wheels, a 14-speaker JBL Synthesis audio system with four-channel amplifier, navigation, seats clad in perforated leather, heated and ventilated front seats, a driver’s seat memory system, wood grain and leather-wrapped steering wheel, wood-grain interior trim, illuminated vanity mirrors, a power rear door with jam protection and rear door glass sunshade, a power tailgate lock, chrome vent knobs, steering wheel-mounted HVAC controls, a 120V accessory power outlet in the cargo area, exterior mirrors linked to seat memory with reverse auto tilt function, integrated signal lamps and puddle lamps, chrome exterior mirrors, door handles and rear trunk trim, and more. The 2019 Toyota Sequoia is now on sale at Toyota Dealers across Canada. For complete and up to date details and specifications, visit www.toyota.ca/sequoia.